Help protect your V-Series machine surface from abrasions or scratches caused by hoops, pins and other items with this convenient protective sheet. 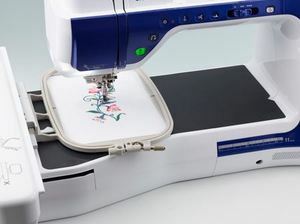 You only have to peel off the adhesive strips on the back of the sheet, slide the sheet under the presser foot and into the workspace, and affix to your machine. This sheet can be removed and reapplied as needed.